I just bought this set a few months ago and I’m more than happy with it. 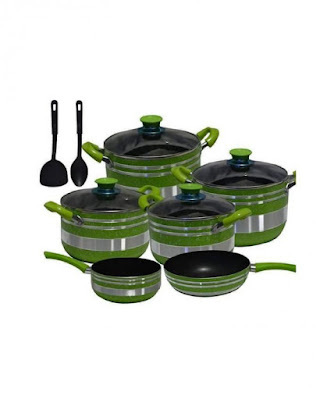 It comes with 4 non-stick pots with glass lids, 2 long handled non-stick frying pans and 2 spoons. Though I went for the blue ones, other colors available are green, silver and red. The pots are non-stick which means that your food will cook without burning or sticking to the surface of the pot. This is not only good for the flavor but also when it comes to cleaning. No more using steel wool. As a mater of fact, scrubbing will compromise the quality of your pots. I was surprised when I received my order because I did not expect the pots to be as big as they are. The second largest is bigger than my biggest sufuria and that is a very good thing. My household has 4 members and I’m yet to use the largest pot of the lot. They get real hot very quickly and that plus the lid help in heat use efficiency. Do not worry about burning your hands though as the handles remain cool at all times. The pots stack perfectly into each other making them space efficient. I however have a hard time storing the lids as the handles makes it impossible for them to fit into themselves. At a price of about Ksh. 4,500, I have to say that this set is completely worth every cent. You can get your set on Jumia Kenya now before they run out. You can also see the best non-stick cooking pots in Kenya in this post.